Welcome to Cornhusker Auto Center people of Madison! We are so excited to share our extensive New and Used Cars, Trucks and SUVs with you and all the services we provide. We are only 15 miles from Madison and it is worth the drive. Whether you are looking for a Chrysler, Dodge, Jeep, or RAM, Cornhusker Auto Center has the car you need. Check out more services that we provide for you. 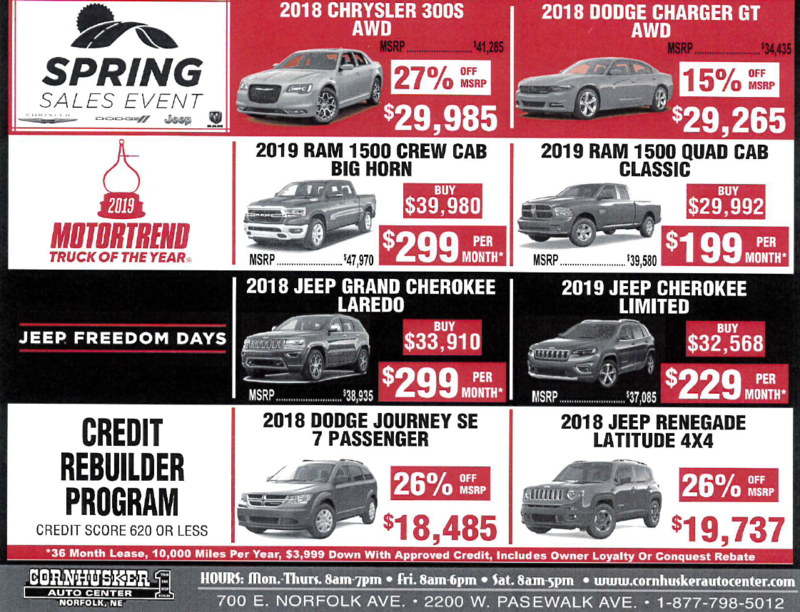 Cornhusker Auto Center has the all new RAM 1500’s, 2500’s, 3500’s, Jeep Grand Cherokee, Wrangler, Chrysler 200, and other Sedans, Town & Country, and much more. Stop in today, fill out a contact form, or give us a call at (877) 798-5012 for more information. Cornhusker Chrysler Dodge Jeep RAM has the best selection of Used Cars in the Norfolk area. We have affordable cheap used cars along with great specials. Stop in today, fill out a contact form, or give us a call at (877) 798-5012 for more information.